Get these 24 oz. solid clear orbit logo acrylic tumblers for your coffee shops and stores to sell with your own brand names or blank. These BPA free tumblers have double wall insulation which helps keep your hot and cold beverages at the perfect temperature. They come with plastic lids and color matching straws which you can remove and then use the slide-lock on the lids for a spill proof option. You can get them with blue, green or red straws and lids. 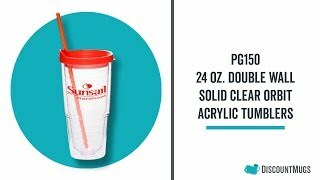 Companies can get these customizable tumblers to use as a marketing tool to promote their business and services. They can be custom printed not just with your logos but also with slogans, graphic designs or your choice of text. Give them out to customers and clients at your next promotional event. You can easily customize your new double wall logo acrylic tumblers using our online tools and D-Lab system. Choose the logo, text or artwork you want to use and upload them onto our design lab. If you’re getting them custom printed, choose the imprint color you want for your font and graphics. You can also just choose to get them with no personalization at all. You are free to request an artwork proof to make sure they will look the way you want them to. Order today with us and get free shipping on your new wholesale tumblers and you will get 110% price match guarantee. Great quality and DM has excellent customer service! Quick turnaround, fabulous customer service and a wonderful product! Our customers will love this! Thank you so much! We love our double insulated cups!! So do our customers, especially in the warm weather... can come back 3 hours later to your car and still have ice in the cup! I have ordered these multiple times for our practice and every once in a while a straw or 3 will be missing but nothing too big of a deal. This last time I received the boxes with almost all of the tumblers extremely dirty, literally had to wash each of them individually so we could still give them out. Also, only one box contained a few straws. I am not too thrilled about that because it seems every time they come worse and worse. I love the looks of them they are just as pictured besides being dirty. Our customers love them too so I reorder so frequently, just very disappointing in the delivery this last time. I leave 4 stars for the quality of the tumblers, but not for the quality of delivery- like I said we literally had to wash them individually to be able to give them out.